Last time I said I would tell about the time I traversed the Marion River Carry. First I need to tell you about the vessel I used to make the trip. 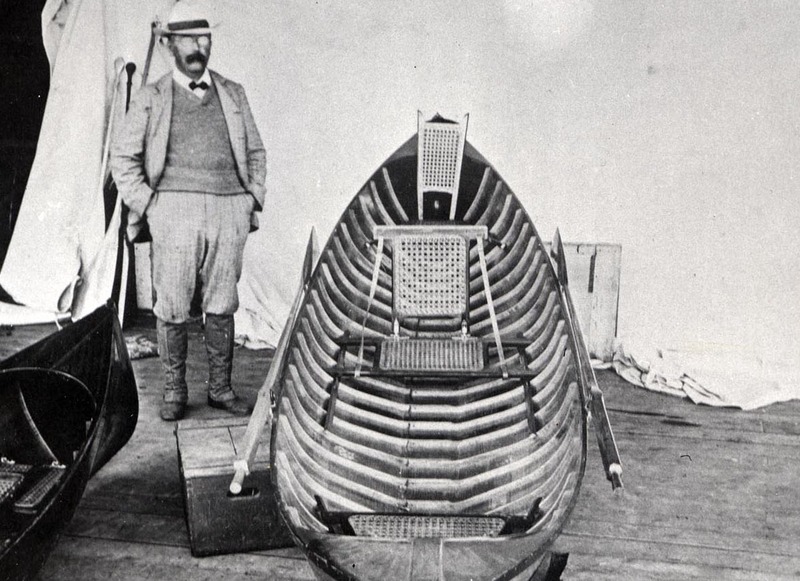 It is called an Airolite Canoe and was devised by a fellow named Platt Monfort of Westport, ME. 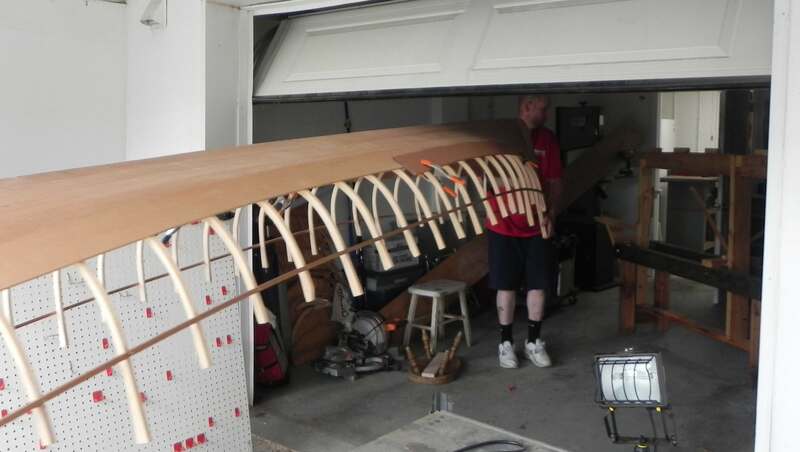 It is basically an assemblage of thin sticks in the shape of a canoe covered with heat-shrinkable Dacron aircraft fabric. 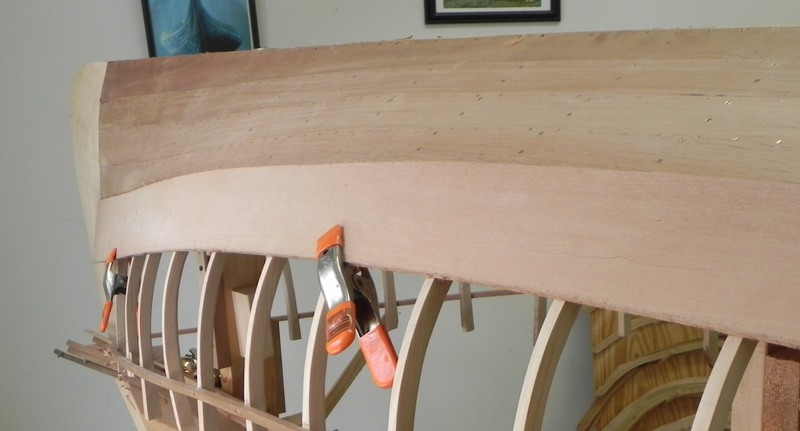 I make his Snowshoe 12 model that is 11′ 8″ long and weighs 13 lbs. 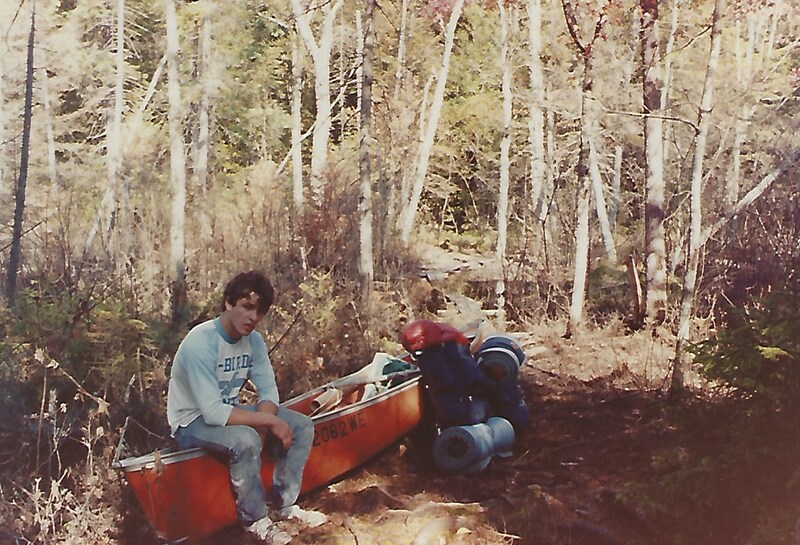 The impetus behind going lightweight was a canoe trip my son, Stew, and I took over Labor Day of 1987. 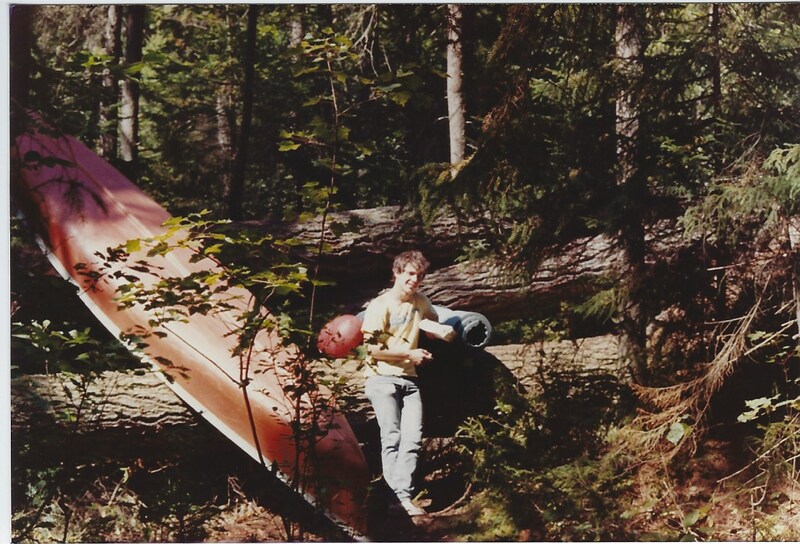 With nothing but a Coleman “Tupperware” canoe, we set out on the three day trip. The canoe plus our gear probably weighed 90 lbs. This mass had to be carried, dragged, slid, or however transported over some mighty long carries. Both Stew and I remember the blow-downs. Here are some smaller ones. The canoe had to be lifted up and over them. Some of the downed trunks were at eye level. A succession of these carries will wear you down. Stew reminded me that we often resorted to dragging the canoe by its painters along the carry. We left an orange trail on the rocks in our wake. The Coleman hardly noticed. I remember one embarrassing incident. Somewhere around Saranac Lake we lost our bearings on a carry. That is not too hard to fathom since we were carrying the boat on our shoulders and our vision was limited. At one point I looked down and saw a manicured pathway. Something was not right so I told Stew that we needed to have a look around. The canoe was let down with a crash. We were left standing, rather dazed, right next to a tee on the Saranac Country Club. Of course, a foursome was just teeing off. Our trip ended at the Saranac Lakes. The are three of them, Upper, Middle, and Lower, are arranged in a horseshoe fashion. We entered at Upper and spent the night on Norway Island on Middle Saranac Lake. Here is a view of Norway Island. I said that you would be amazed at how the Marion River Carry was transformed in the late 1800’s. It began as a mere dirt track used first by Native Americans and then by guides to skirt the Marion River rapids. 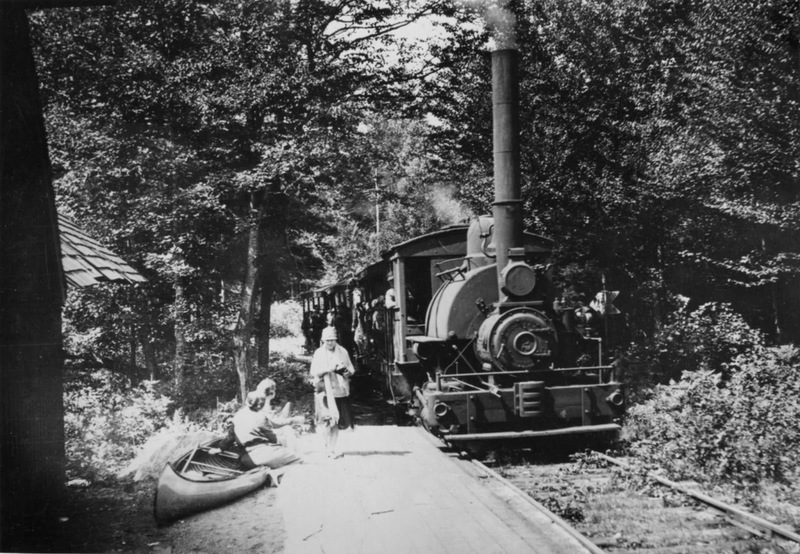 Then, with the advent of steam power, steamboats brought a more enjoyable and faster trip across Blue Mountain to Raquette Lake and back again. Of course, those steam-borne passengers would miss the homespun tales and romance that guides with their boats could provide. The Adirondack Experience (Adirondack Museum to us old folks) has a superb diorama that depicts the impact of this second direct rail line to Raquette. 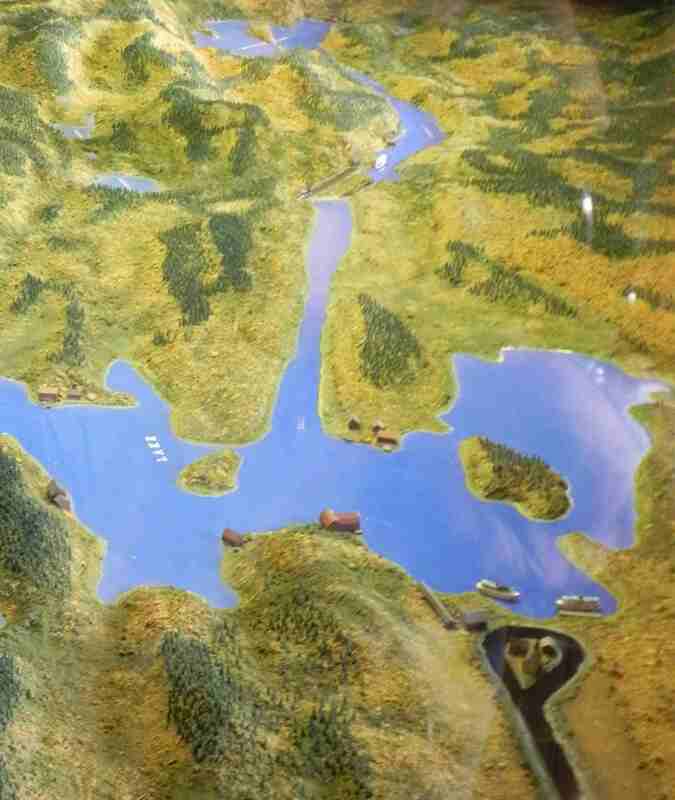 Below is a photo of the Museum’s diorama of a view facing east of the Raquette Lake Rail terminal and the Marion River (upper left). Diorama at the Adirondack Museum depicting the New York Central Terminal at Raquette Lake. The terminal is below and to the right. The Marion River Carry is across the lake and slightly to the left. 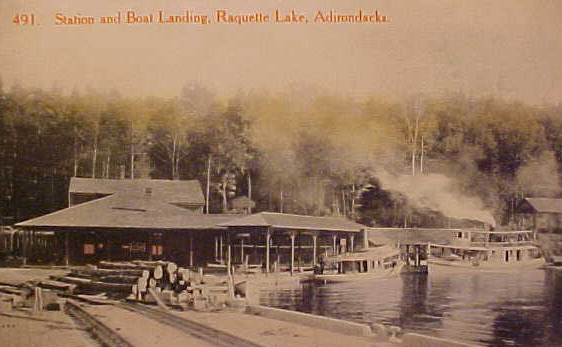 Raquette Lake Station in 1909. Photo courtesy of Adirondack Experience. Previous to the New York Central coming on the scene, the flow of new visitors to Raquette was mainly from east to west, from Blue Mountain Lake to Raquette because of the rail line to North Creek. The NYCRR changed that so that the flow of arriving tourists was now overwhelmingly in the opposite direction. This must have put great stress on the Marion River Carry. Apparently it could not handle the upsurge in passenger volume. Then too, passenger must have included many women who where disdainful of walking three or four miles across the Carry in their best attire. Also there were very posh hotels on Blue Mountain Lake that would attract tourists to Blue Mountain Lake. One of these was the Prospect House, the first hotel ever to boast electric lights in every room. So expectations may have run very high so that tourists were looking for much more than walking a dusty dirt track to get to their accommodations. Regardless, someone dreamed up a solution to the problem, a very small standard gauge railroad. 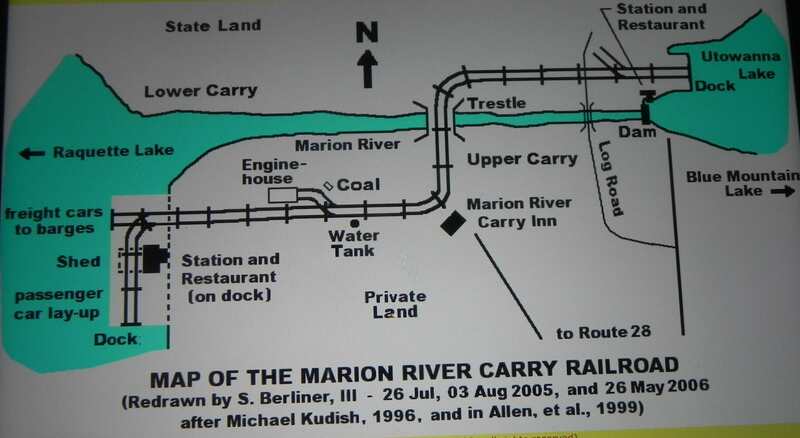 Never officially named, it became known as the Marion River Carry Railroad. At a little over 4 miles in length it became the shortest standard gauge railroad in the world. 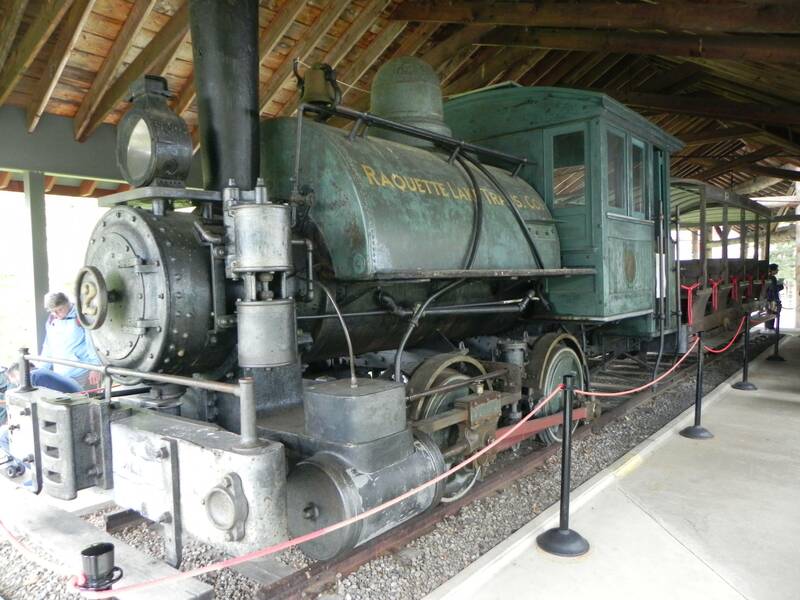 Here is the original locomotive with its open-air cars as they appear in the Marion River Carry Pavilion at the Adirondack Museum. Marion River Carry Railroad locomotive. It has what is known as saddle-back boiler. Rear car on the Raquette River Railroad train. These were obviously surplus rolling stock from Brooklyn. Here is a view of the locomotive on the carry. Marion River locomotive on the Marion River carry. The tall smokestack increased the locomotive’s power. Photo courtesy of the Adirondack Experience. Several people have produced maps of the carry. Here is one by S. Berliner III. The Carry was much more elaborate than I expected. There was a station at each end of the Carry and each had a restaurant. There was also an Inn. I imagine that these luxuries were to entertain travelers as they awaited the next steamboat. S. Berliner III has done a nice job of documenting the history of the Marion River Carry railroad. 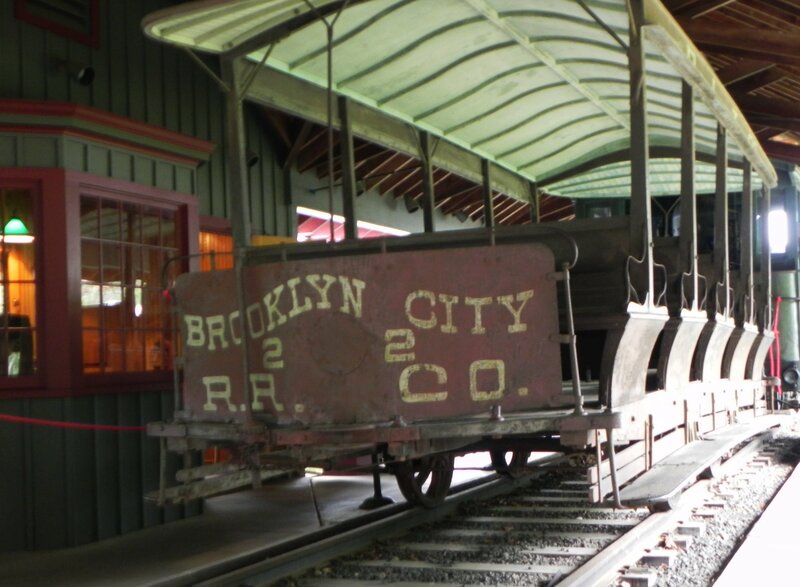 He says it was commissioned by William West Durant in the summer of 1899, Durant obtained the passenger cars, which were horse drawn streetcars from Brooklyn for $25 each! This rolling stock operated for nearly 30 years, It was retired in September , 1929 and placed in a shed near the carry. There it remained until its preservation became part of the impetus for the founding of the Adirondack Museum in 1955. There it has amused and educated thousands of Museum visitors for over 60 years. Next time I tell how I traversed the Marion River Carry in my ultra light canoe on my way from Blue Mountain Lake to Long Lake. In the Adirondacks portages are called carries. The Marion River Carry is particularly well known. You will find out why from the next post. If you have been following along you know that William West Durant was the author of the Great Camp Style of Adirondack architecture. 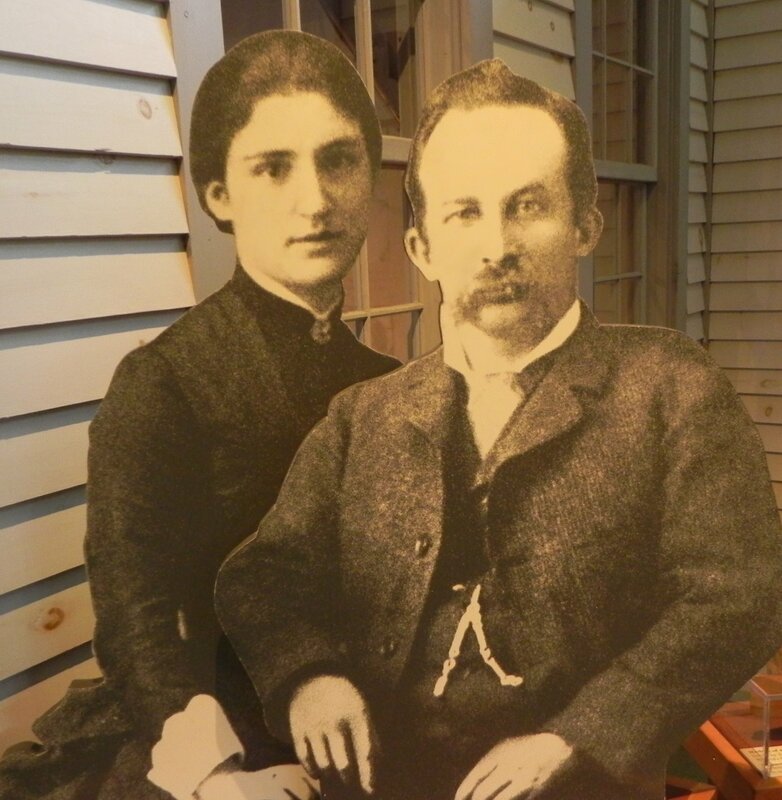 William was sent by his father Dr. Thomas C. to Raquette Lake in the early 1870’s to develop 500,000 acres of Adirondack land he acquired while serving as VP of the Union Pacific railroad. To facilitate travel to Raquette Lake by those interested in buying land or timber from the Durants, track was laid from Saratoga Springs to North Creek, NY in 1871. But it was still a day’s travel by stagecoach from North Creek to Blue Mountain Lake. There a guide and boat could be hired to take you on to Raquette Lake. Guide carrying his boat in traditional fashion. Photo courtesy of the Adirondack Experience. 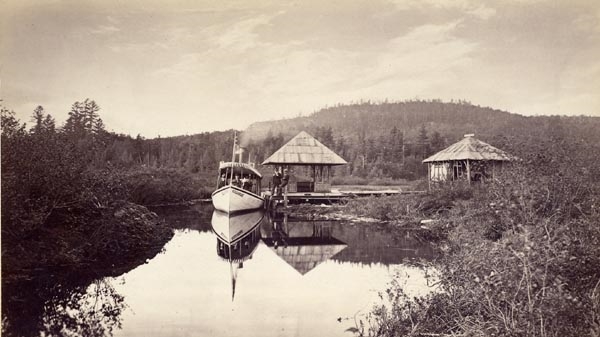 William improved upon this mode of transportation by having two steamboats built, one for Raquette Lake, the Killoquah, and the other for Blue Mountain Lake, the Toowahloondah. Blue Mountain Lake is connected to Raquette Lake by the Ectford Chain of lakes (Eagle and Utowandah Lakes) and the Marion River. William dammed up the Marion River to allow the Toowahloondah to navigate passage through the Ectford Chain to the head of the Marion River. The passengers would disembark at the dock at the head of the Marion River and walk the 2-3 miles to catch another steamboat that would take them on to their final destination on Raquette. Presumably baggage handlers would transport their duffel across the carry. Steamboat at dock. Photo courtesy of the Adirondack Experience. Here is a steamboat at dock. This may be the dock at the Marion River side of the carry although I am not sure. A fortunate circumstance significantly aided the Durant’s scheme to develop their vast land holdings in the Adirondacks. William Henry Harrison Murray published his book Adventures in the Wildernessin 1879. 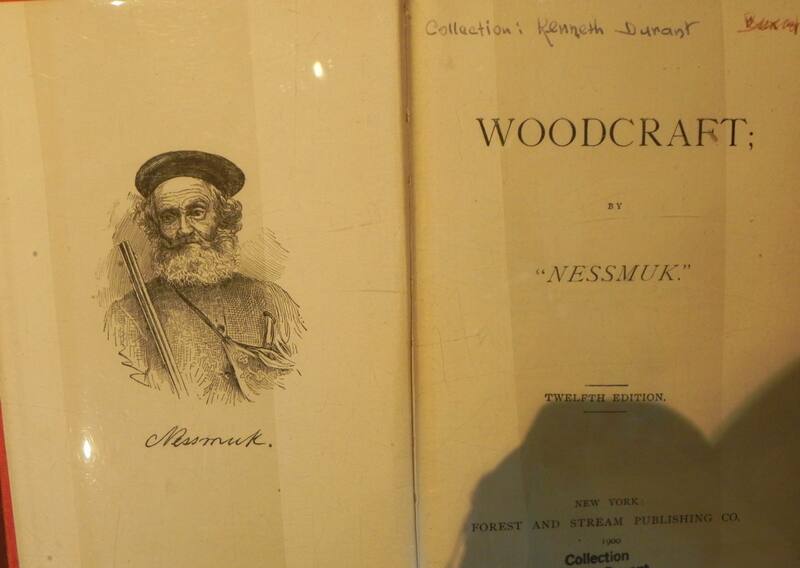 Murray’s book was a sportsman’s guide to the Adirondacks. It told of a vast wilderness with fish and game just ready to be had with rod and gun. Just a short visit to this paradise would restore one’s health. He gave instructions on what gear to buy, where to stay, the best guide to hire, and even a railroad timetable. Murray’s tale was centered on Raquette Lake so tourism exploded there. 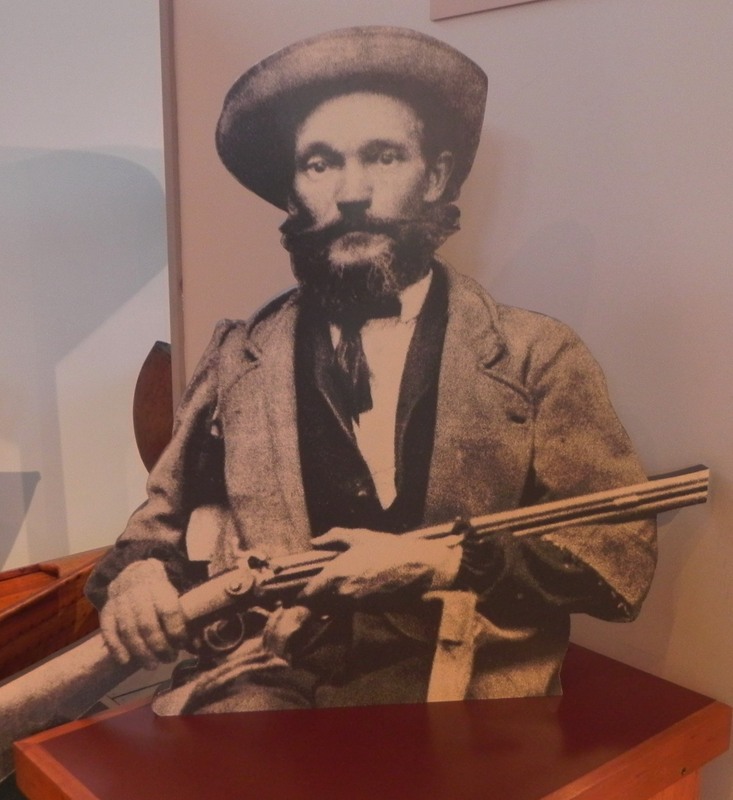 Durant had just finished the first of his Great Camps, Camp Pine Knot, so he was ready to entertain those interested in buying land and timber. Part I of this post serves to give a background on the Marion River Carry. The next post will describe the almost unbelievable changes that came to the Marion River Carry as the eighteen hundreds came to a close. Fran and I have moved a number of times in our married life, in fact, at least five times. As the years have crept by the subject of moving to a retirement community have kept coming up. After all, two people living in a four bedroom home didn’t make a lot of sense. 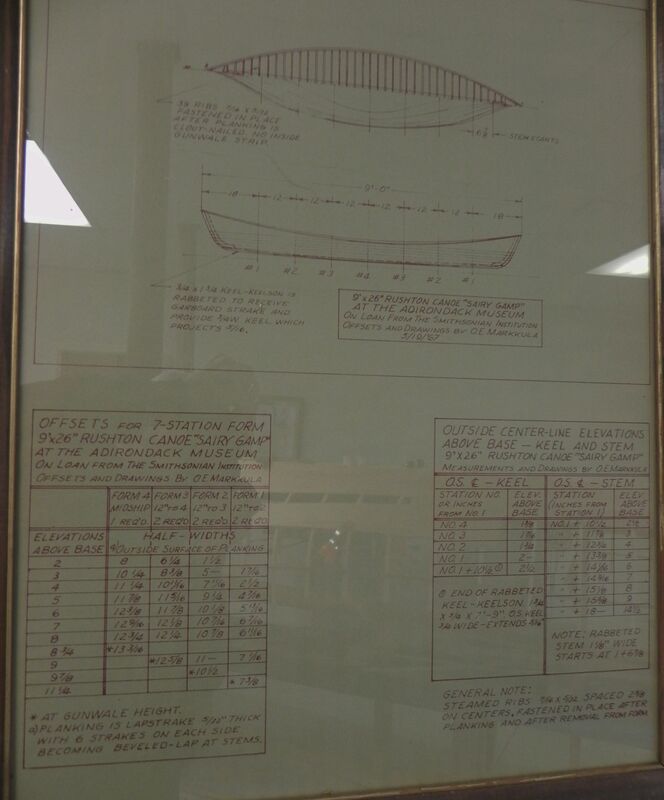 My objection was always that I would have to give up my boat shop. Upon visiting a retirement community about a mile away, they made an offer I couldn’t refuse. They would convert a garage and some extra space adjacent to it into a boat shop. It turned out that this space was about equal to the usable space in my present shop. So we signed up and a moving date was set for May 3. 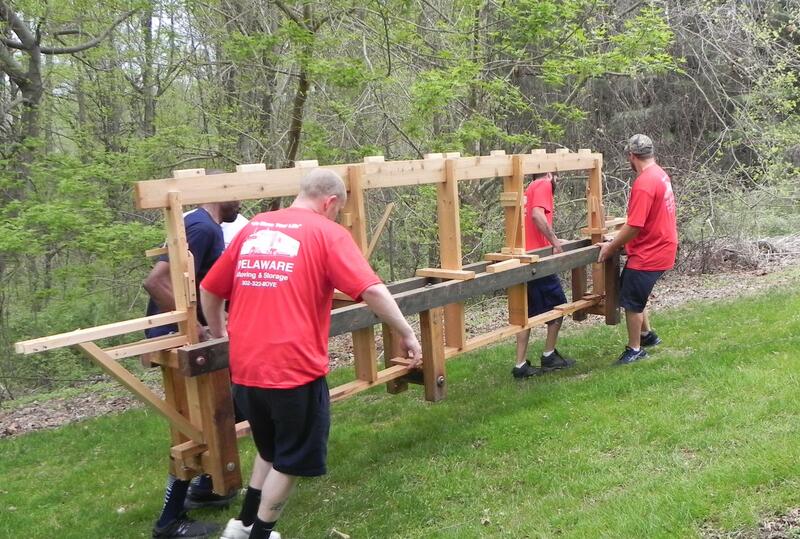 So here’s how the move of a partially completed guideboat went. I must say the movers were very conscious about insuring that the boat moved without a scratch. Here’s the boat waiting to be moved. 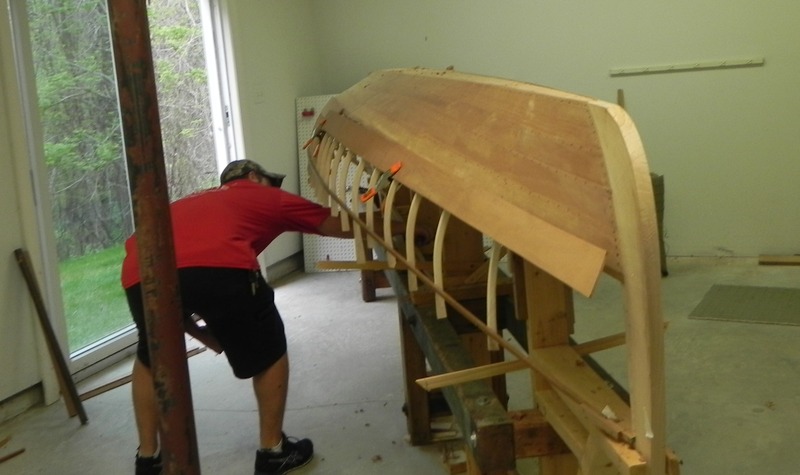 Partially completed guideboat ready to go. 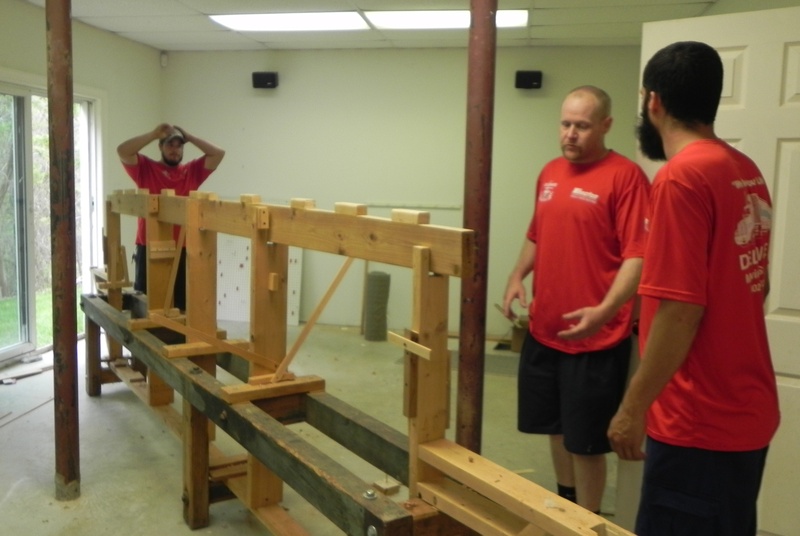 Here’s a view of the movers inspecting the boat and deciding how to safely move it to the truck. They can take it out through a sliding glass door. Careful inspection of the hull before moving it. Next step was to remove the hull from the strongback, and start moving it out. Lifting it off the strongback. Here goes the hull through the door. The hull goes onto the truck. Next comes the strongback. It was given to me by my Uncle Donald, and it is made of Georgia yellow pine, I’m told. He spotted it in the bottom of a burned out mill in New Hampshire, and asked if he could have it. The powers that be said “Sure, if you can get it out of there, you can have it!” Now Uncle Don was not a man to be easily deterred, and somehow he got it out. So it starts moving towards the door. Four men and up the hill! Meanwhile, the hull rests safely in a truck entirely devoted to it and the strongback. Hull safely padded and waiting for its companion strongback. The strongback arrives and then is strapped in. Both safe in the truck. We arrive at the new shop location and start moving in. Hull goes into its new home. Hull is ready to install on the strongback. Here’s the shop after moving power tools, benches and other equipment are moved into the new space. So the move went without a hitch, although as you can imagine there is still some organization to be done. This boat and its shop are located some four hundred miles south of the town of Long Lake, in the Adirondack mountains of New York. 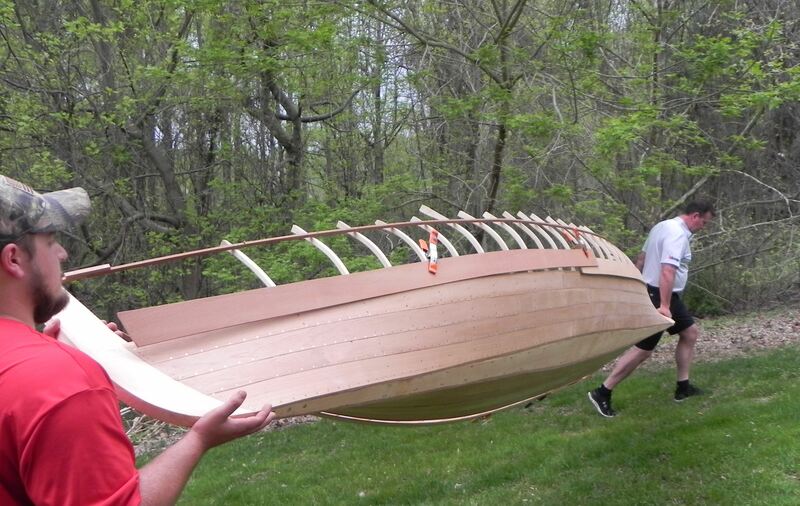 The completed boat will eventually make its way north there. Fran and I have been associated with Long Lake for nearly thirty years. We have grown quite fond of the town and believe that it represents certain special qualities. We have always lived near large cities, Baltimore, Philadelphia, New York and Boston. Big cities swallow up their satellite towns by imparting on to them the big city’s culture, overwhelming the character of the smaller entity. This is not so in the towns in the Adirondacks which are far away from metropolitan areas. They have their own unique characteristics. We have begun to realize what special characteristics they show. So from time to time, we will highlight how Long Lake, a town of nine hundred people, exhibits its own personality. These essays on Long Lake will be interspersed with the usual boating topics of this blog. We hope you enjoy them. I had a note from Tom from Wisconsin. “I have greatly enjoyed your book (Guideboat Paddles An Adirondack Treasure”) I got some time back. While I have acquired some interesting Penobscot paddles over the years, I have always wanted an original guide paddle. I was fortunate recently to acquire one. 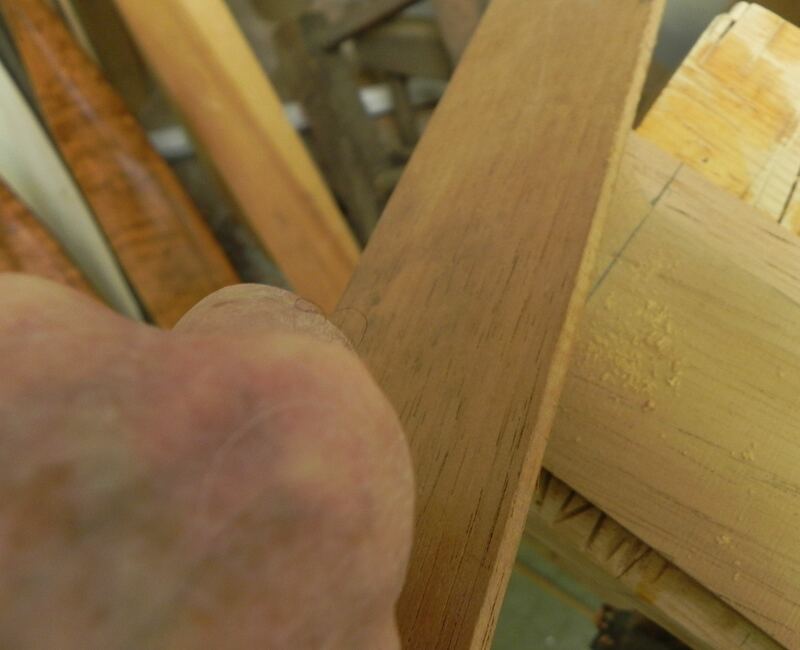 It appears to be a steering paddle at 56.5″. The grip and motif appear to be A. H. Billings much like the ones in the Clark’s Camp find. 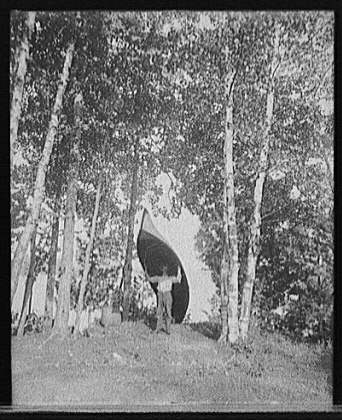 (Paddle in the Adirondack Museum’s collection from the Clark’s Camp on Blue Mountain Lake). 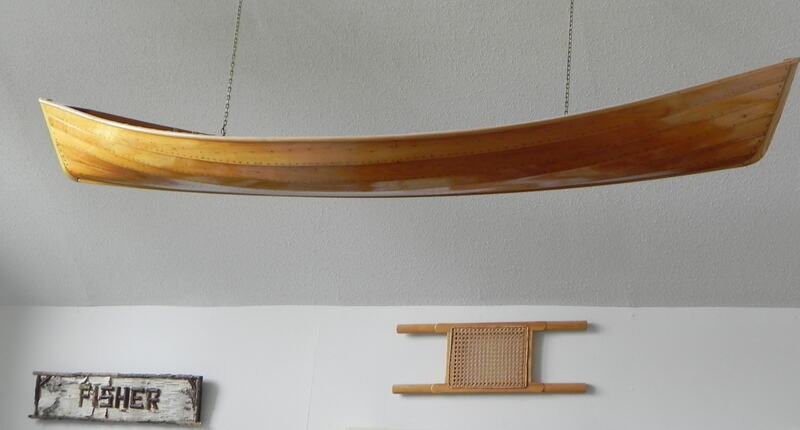 It is made of bird’s eye maple which really makes it a gem. The initials E K are carved on the motif. I feel so fortunate to get one. It came from an auction in Poughkeepsie, NY. Grip and motif on Tom’s paddle. 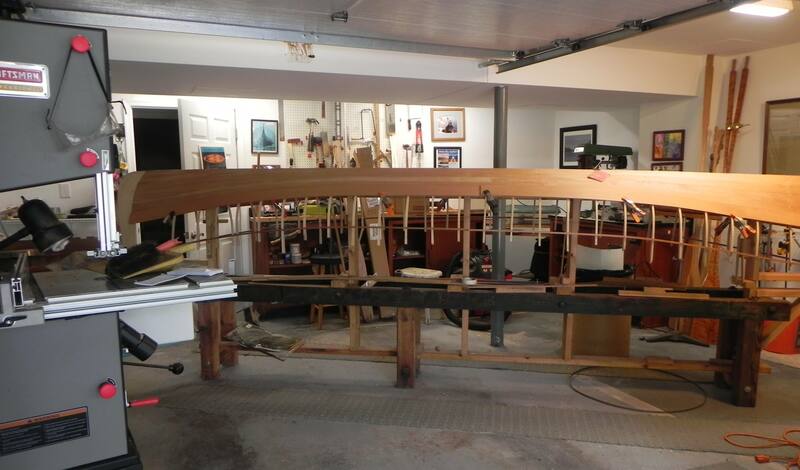 Tom’s guideboat steering paddle-full length. Here is the grip and motif of the Adirondack Museum’s Clark’s Camp paddle. 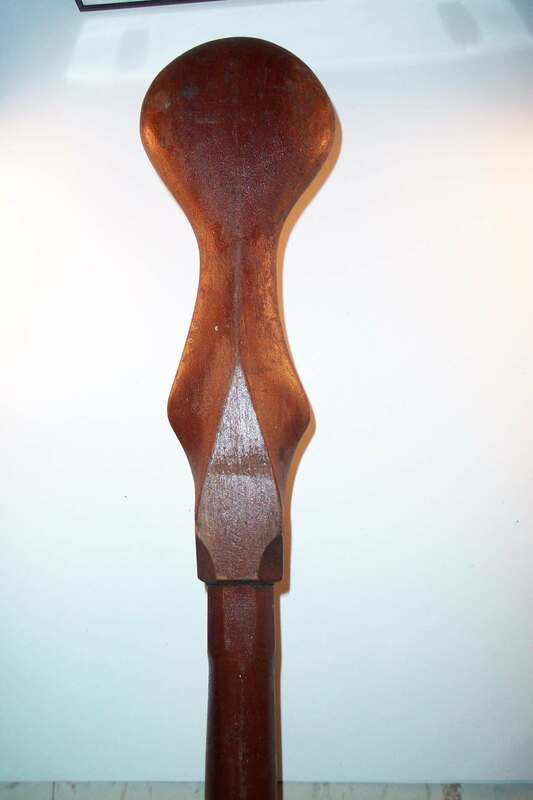 Clark’s Camp steering paddle from the Adirondack Museum’s collection. There is no doubt that these two paddles were made by the same person. Tom believes the are from the hand of A. H. Billings, a builder of guideboats in the late 1800’s. Here is a photo of Billings. A. H. Billings, guideboat builder. He looks to be an impressive fellow, one I would like to meet. I couldn’t find any further information on him except the photo below where he is attending some sort of convention promoting outdoor adventure. I am told these sorts of events occurred yearly in New York City. 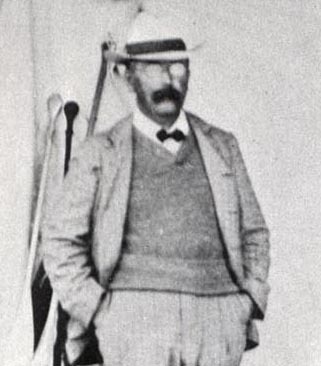 A. H. Billings attending some sort of convention promoting outdoor adventure. Tom and I chatted about the development of the Northern Wisconsin wilderness and how it differed from the Adirondack wilderness. Whereas rails were first constructed in Northern Wisconsin to bring out timber, the loggers in the Adirondacks used the natural watercourses to funnel their logs to the great metropolitan hubs. Once they had exploited the timber wealth of Northern Wisconsin the railroads then decided use their rails for a another purpose. They enticed the super wealthy of Chicago and Milwaukee to build camps in the northern woods thereby deriving a second income from tourism. This was opposite from the Adirondacks. Here the rails were laid down to bring the wealthy and others from a teeming, smoggy, hot summer existence in a big cities to a virtual paradise by comparison. The fact that the Adirondacks had two major watercourses to transport logs to market gives an interesting sidelight to Adirondack history. The major water highways where the Raquette and the Hudson Rivers. The Raquette was less favorable since logs went to Canada where they demanded a much lower price. Logs bound for the Hudson wound up in Glens Falls where they were sawn into lumber. Their ultimate destination was the great metropolitan cities of the east. The economic incentive to get logs from the Racquette drainage to the Hudson was a major one. Farrand Benedict, professor at the University of Vermont, spent much of his working life trying to connect the Racquette River with the Hudson. An early scheme would use the Fulton Chain of Lakes, and others to transport timber and mineral riches out of the Adirondacks and agricultural products into it. When that scheme failed he decided to try to join the Raquette River at Long Lake with the Hudson at Newcomb, a distance of 14 or 15 miles. Work was started in the 1870’s somewhere west of Newcomb to build the canal and necessary locks. It would require damming up Long Lake just below its outlet to raise its height twenty feet! There was great opposition from the Raquette loggers who didn’t want their logs going to the Hudson. Obviously Benedict’s plan did not succeed (my camp in Long Lake would be under water if it had). However his attempt to join the two mighty rivers can still be seen today by bushwacking or flying Helm’s Aero Service in Long Lake. I suggest the latter. I finally finished round 4 of planking on my latest guideboat. This took longer than expected because we are preparing to downsize and move to a smaller home. The good news is that I will still have a boat shop. The bad news is that many interruptions occurred during planking because of other higher order things needing to be done. 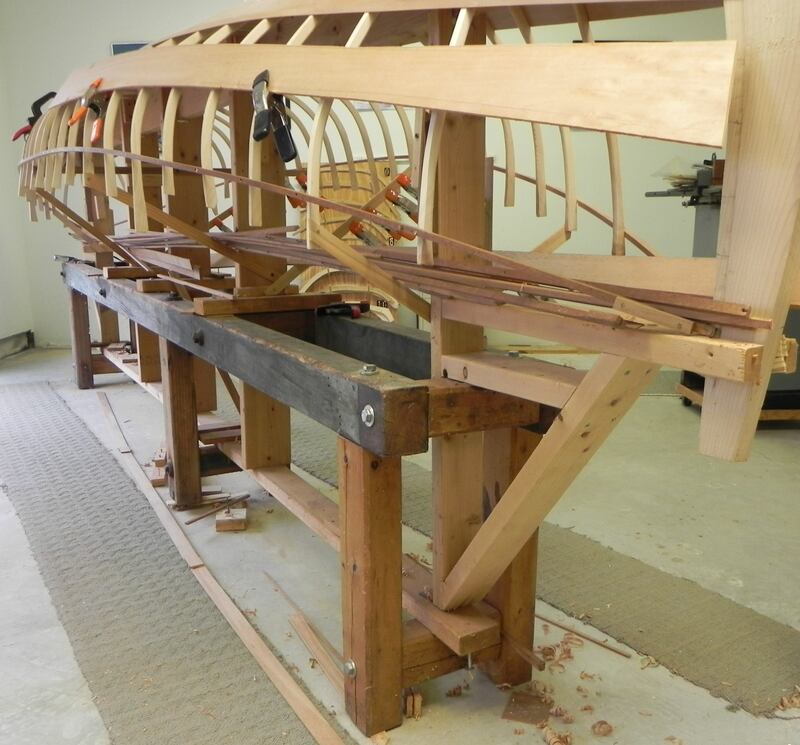 Interruptions break up the rhythm of planking and cause much more trips back and forth between the hull and the bench. Finally, all is ready for hanging a plank. 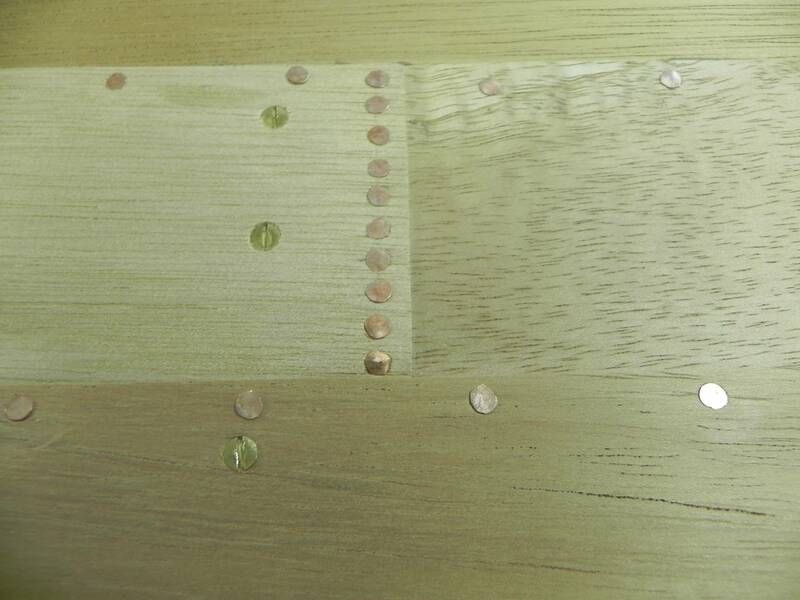 The bedding compound is applied, the plank is fastened with brass screws and the tacks “stuck”. Here is what it looks like just before clinching the tacks. Round 4 of planking ready for clinching of the tacks. 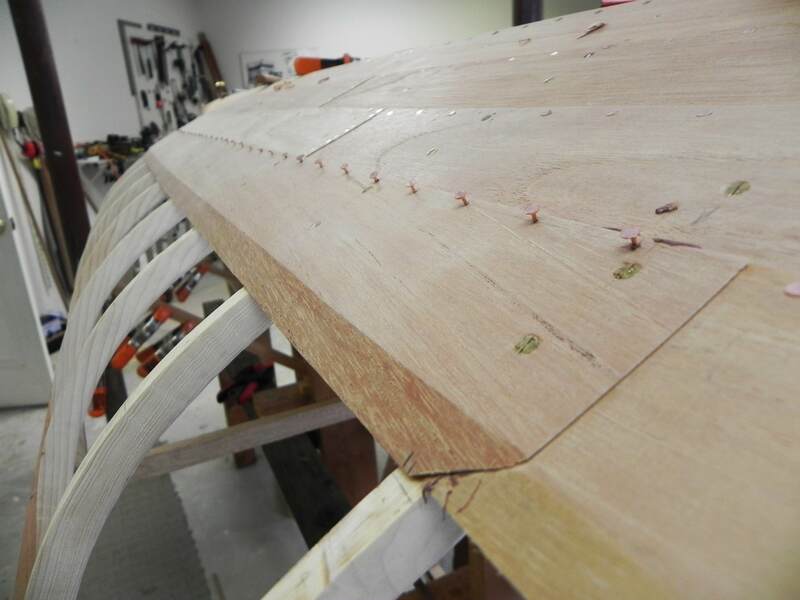 A little diversion here, Scarf joints are necessary when planking because it is impossible to have a single plank span the width of the hull. A scarf is merely a bevel cut into each plank so that they fit smoothly together. Here I have located the scarf over a rib. That is a good place to locate it because the scarf is hidden from inside the hull. Also fastening it to the rib probably gives it added strength. I didn’t know of this custom when I built my first boat and my scarfs ended up between ribs. After 20 years of use I see adverse effects of doing it this way. Laying out a scarf joint. My scarf joints are 7/8″ wide. After laying it out I use a chisel to cut away the excess to form the scarf. Chiseling away the excess to form the scarf. Incidentally I bought the Chinese chisel in the Long Lake hardware store for very little money. It is a great tool. I use my sanding board to smooth the surface of the scarf. 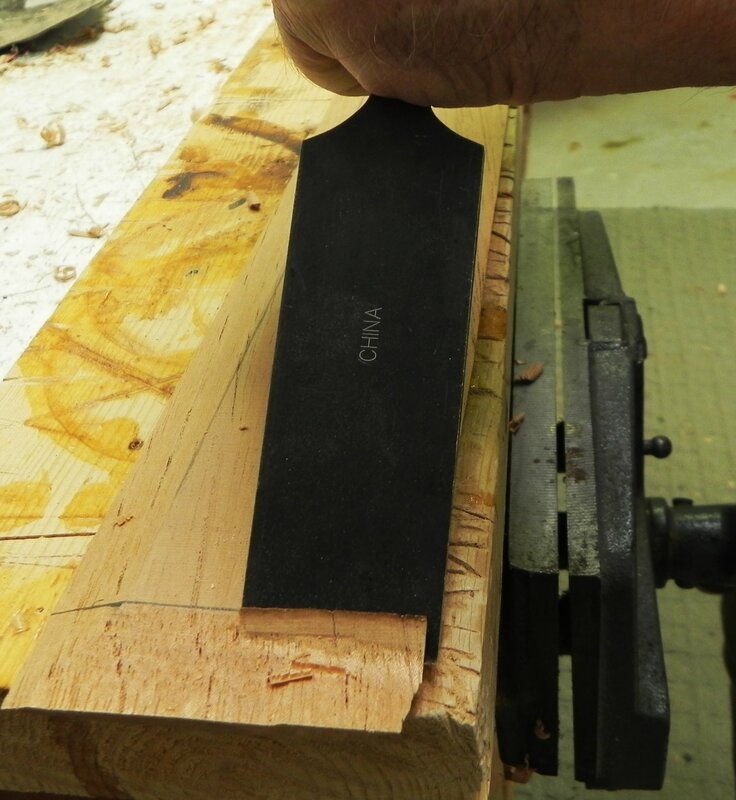 The scarf is smoothed using a sanding board. Before the adjoining plank is fastened down, I make sure the fit is a good one. Then tacks are driven and clinched along the edge of the scarf. Here is a completed scarf. 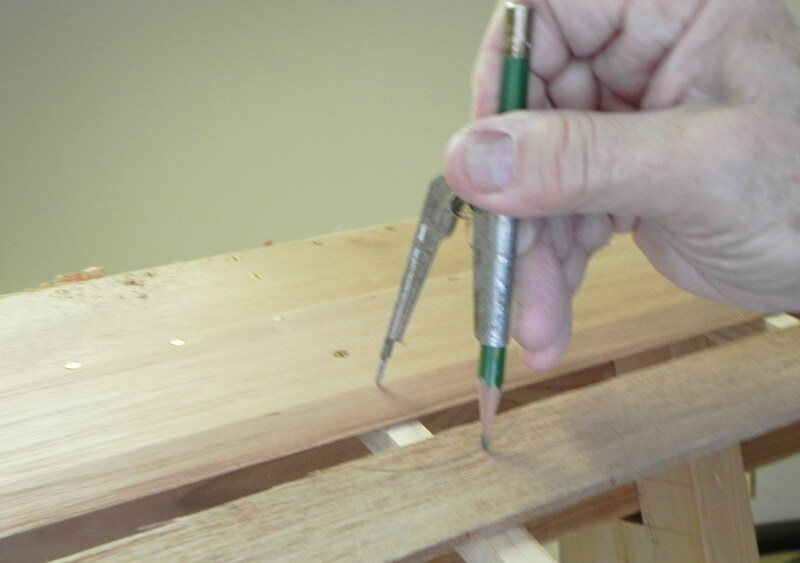 Tacks are driven close together to seal the joint. Despite the challenge of planking a guideboat, or perhaps because of it, I enjoy doing it. There is great satisfaction in taking a bundle of sticks obtained from the root of a tree, fastening them to a long, tapered board and them covering the whole thing with an extraordinarily thin jacket of wood. 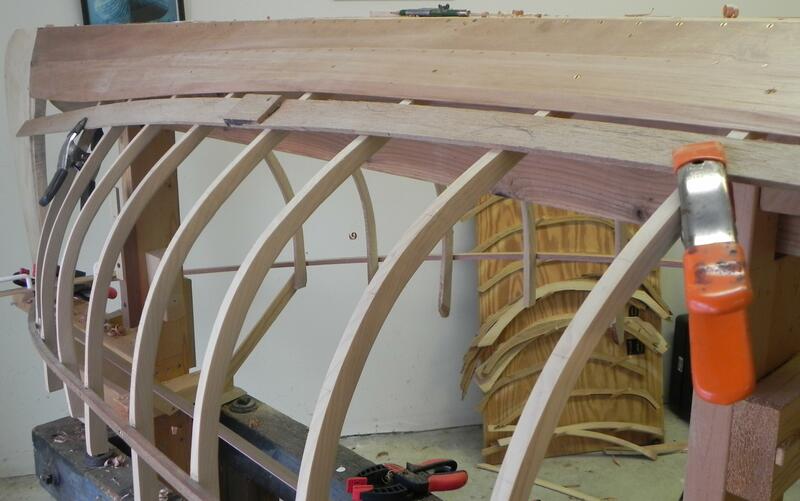 But even more, the guideboat hull reveals its sensuous, feminine nature as each round of planking is set in place. It is indeed a joy to fill space with such a beautiful object that many have called a “work of art”. I learned something while planking this time around. It is a shortcut that avoids spiling. 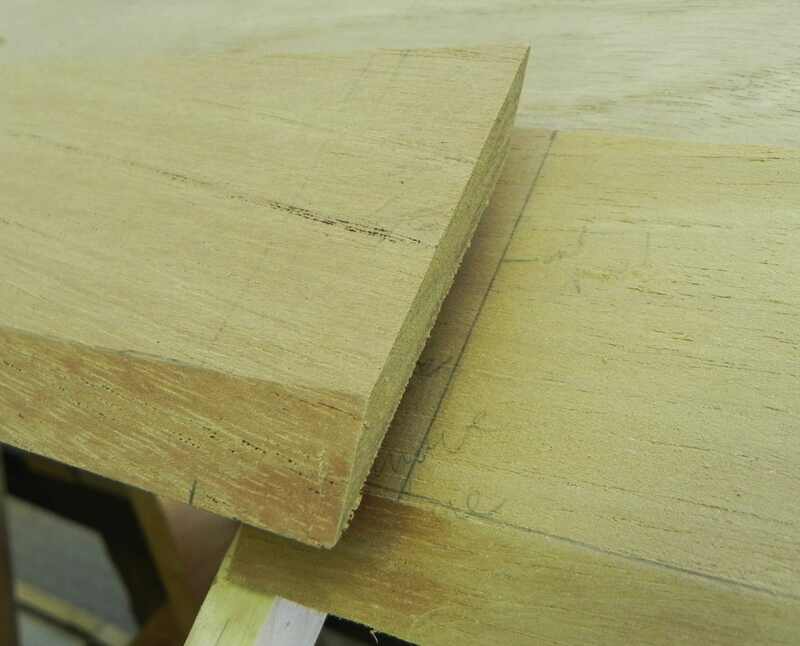 It uses the planks from the previous round as a template for the next round. So here is what you do. Taking round 4 as an example, you have both sides all set to hang round 4. Go ahead and fasten the planks on one side of round 4. Now take one of the planks from the other, unfastened side and hold it up against the fastened down round 4 plank. Obviously, it will not fit exactly to the previous plank but it won’t be too far off. Now lightly mark on the “template plank” how far off it is at several points. The deviations will come at the hood end (stem end) and around the midships. 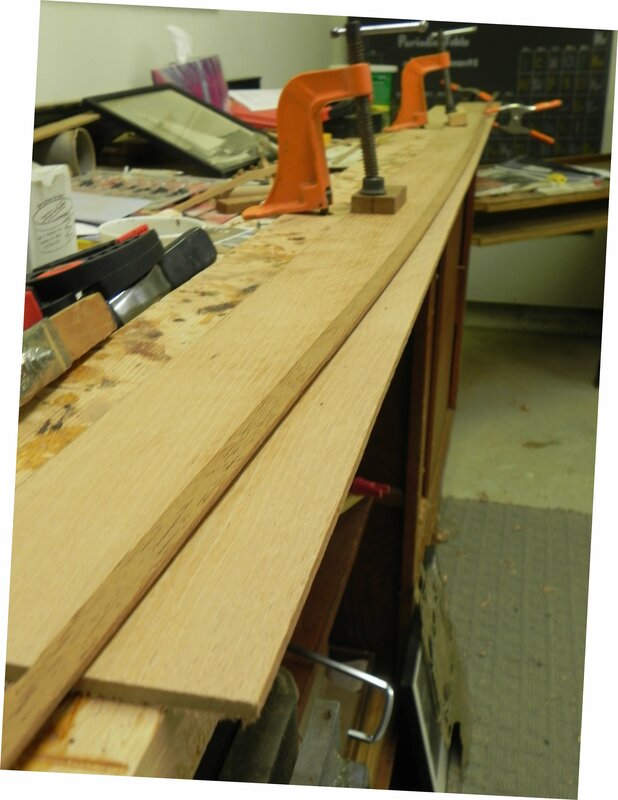 Take the template plank and lay it down on fresh planking stock. Mark off on the fresh stock where it deviates and where it pretty much matches. Now you have a pretty good replication of where a round 5 plank matches the edge of round 4. 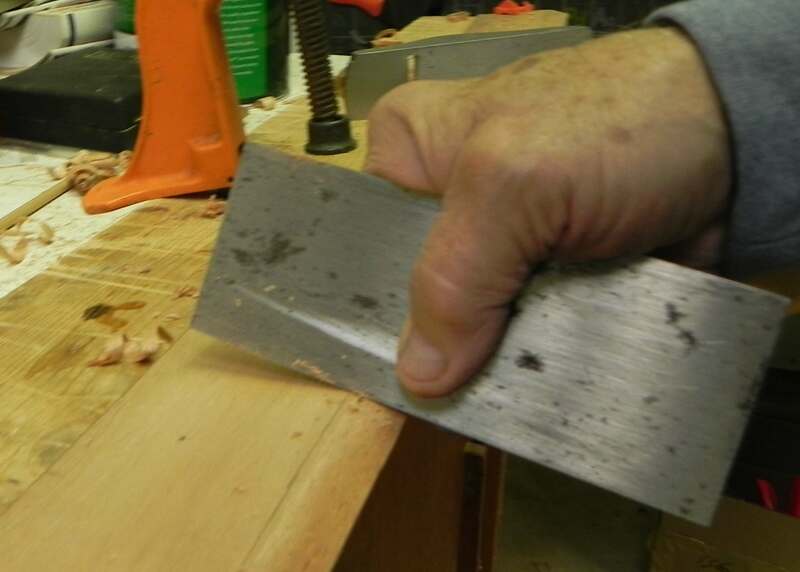 Cut off the excess with a band saw and trim it with your block plane. Hold it up against round 4 and make corrections as necessary. Here is what it looks like. A new partial plank for round 5. 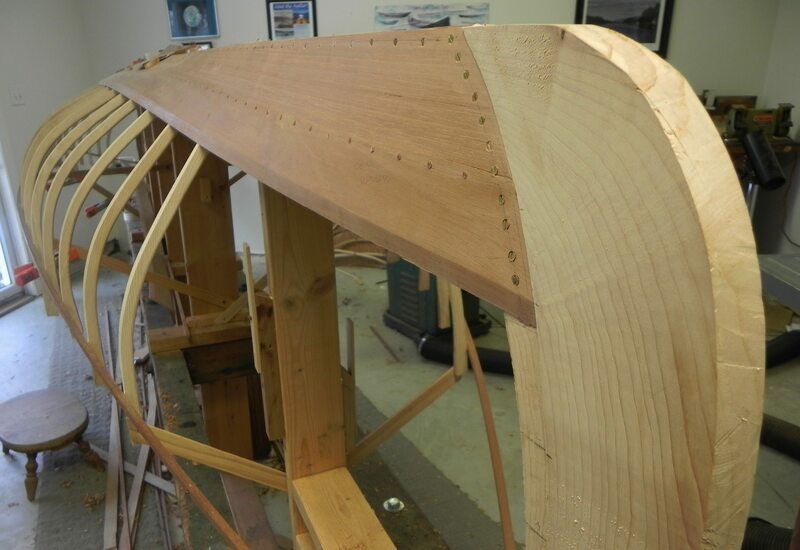 What about the trailing edge of the plank? Slide the partial plank down past the tick mark denoting the end of plank 5. Don’t shift the plank sideways. 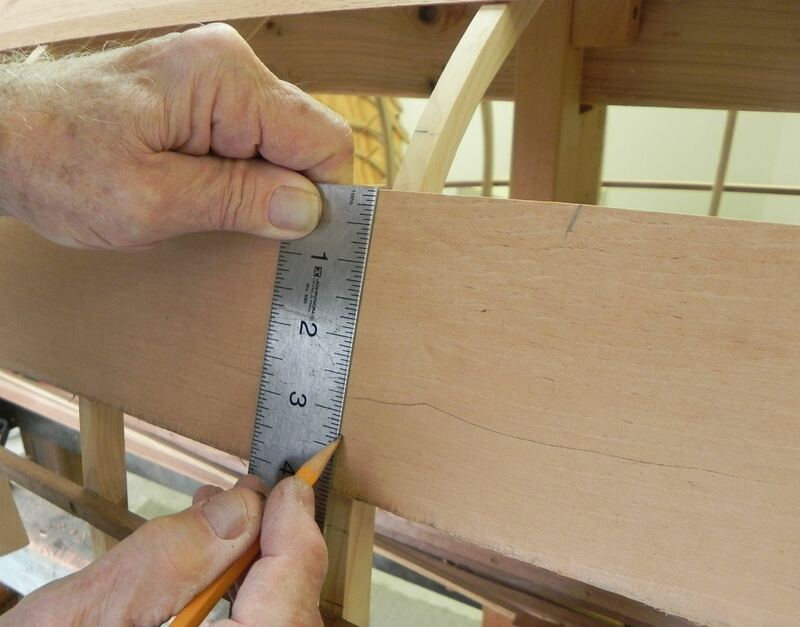 Now measure the distance from the top of the bevel on plank 4 to the tick mark on the rib for round 5 at that station. Mark that distance on the new partial plank. Here is what is looks like. Measuring the width of the new plank, top of bevel to tick mark. Recording the width of the new plank. Now you just connect the dots using a batten. Connecting the dots using a batten to define the other side of the new number 5 plank. Next time I may go back into guideboat paddle lore to conquer up a story. The choice of oars for guideboats has always puzzled me. It is somewhat an enigma. 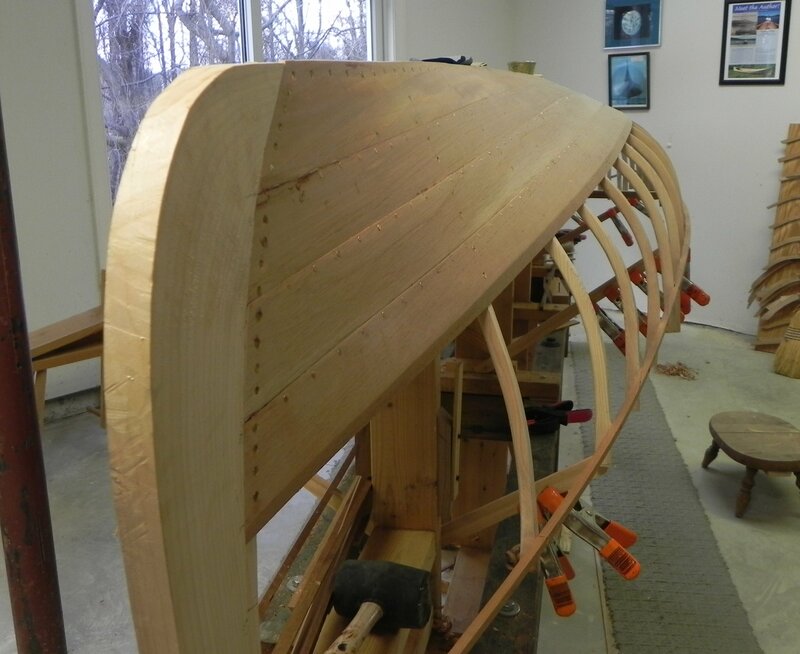 It is really the choice of how to connect the oar to the hull that seems odd to me, not that the oars themselves are odd in any way. 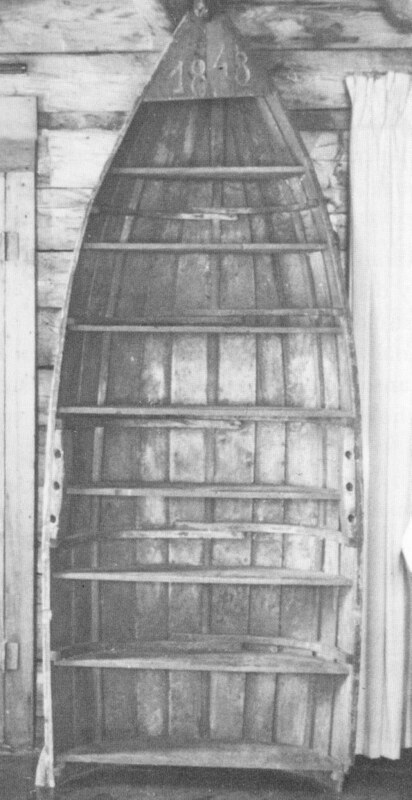 The very earliest Adirondack boats used thole pins to direct the force generated by the sweep of the oar through the water to propel the hull. Thole pins are nothing more than wooden pegs mounted upright on the gunwale. The loom of the oar fits between them. 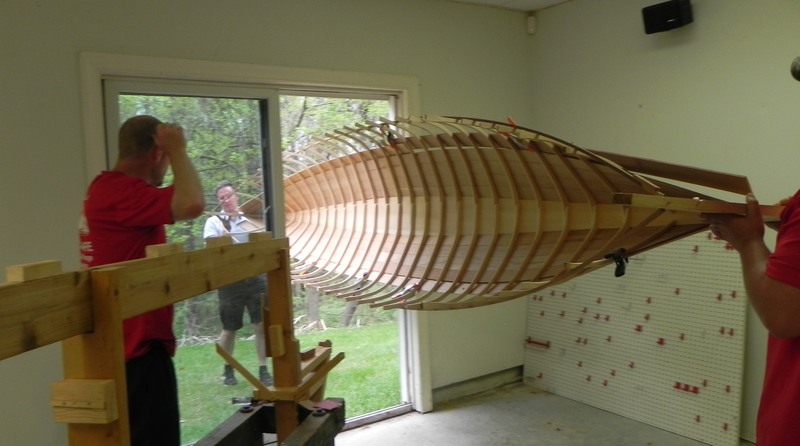 The main advantage is that they allow the oar to be feathered, that is the blade is turned parallel to the water as the oar is being retrieved to begin the next power stroke. 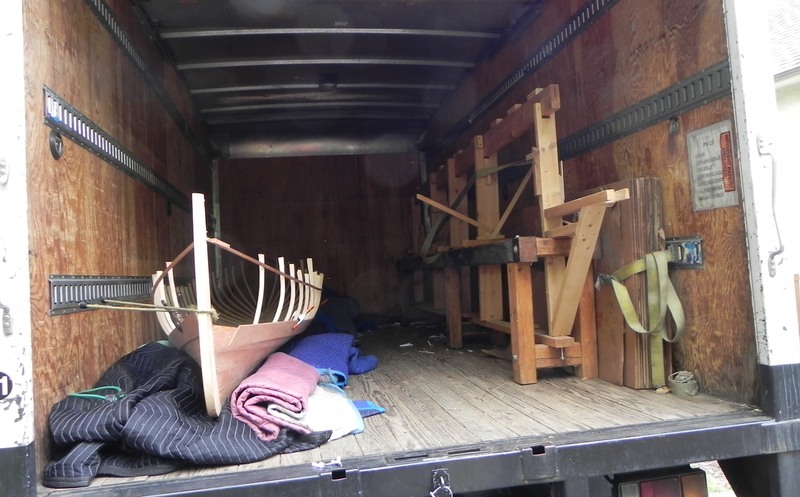 Here is a photo of the very earliest Adirondack wooden craft. I call it the bookcase boat because it was made into a bookcase once its useful life had ended. It resides in Brandreth Park in a compound owned by the Brandreth family. 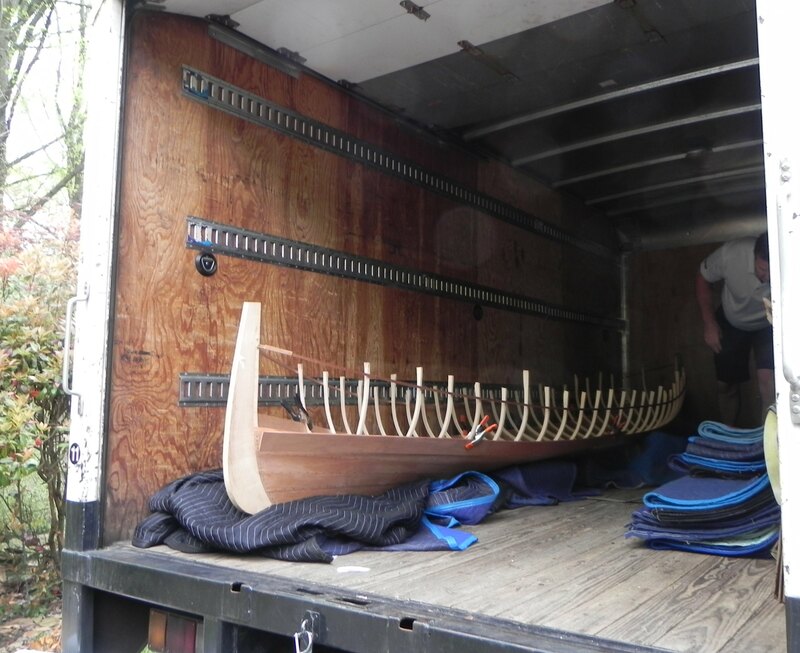 Franklin Brandreth, the patriarch, collected Adirondack boats and this is one of his most precious acquisitions. On the deck of the bookcase boat is this inscription “1848” so this is a very old boat. It would have rotted away out of sight somewhere had it not been made into a piece of furniture. The bookcase boat. 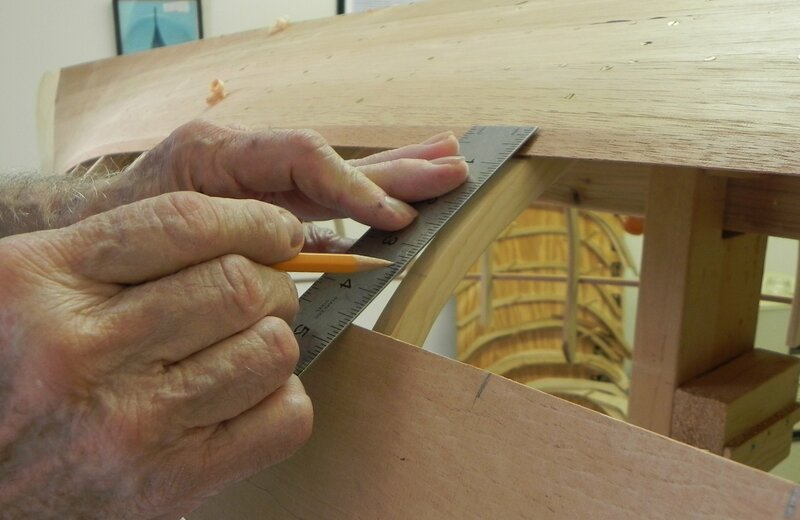 Holes to provide for insertion of thole pins are found on each side of the hull about midway down from the bow. Thole pins had the advantage of being cheap, lightweight, and allowed the oars to be feathered. The disadvantage was that one could never take their hands off the oars or they would likely go overboard. This disadvantage was overcome by using pinned oars. Here the oar has a pin connected to it via a “horn”. 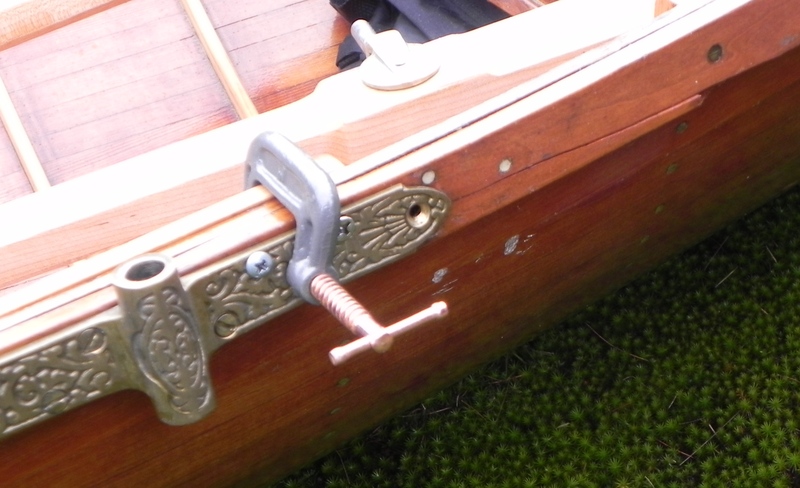 The oarlock, attached to the gunwale, accepts the pin and is called a “strap”. 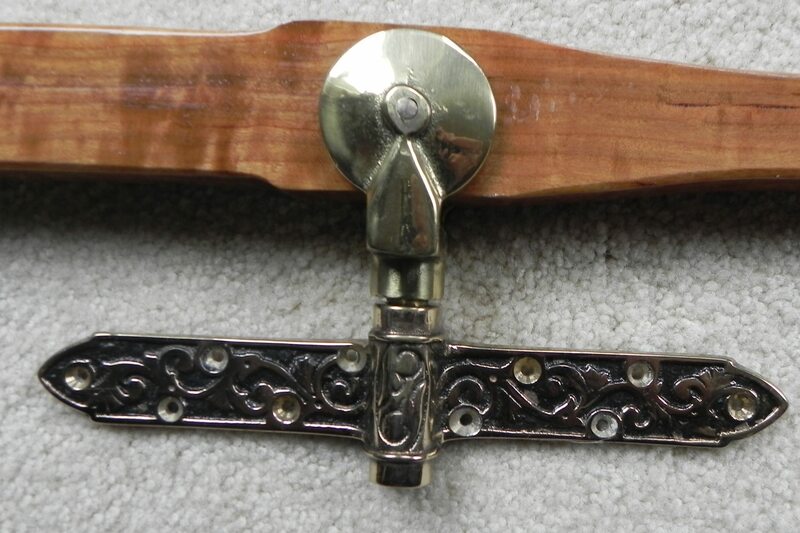 Here is an example of a horn and strap. Horn and strap arrangement for guideboat oars. Horns and straps eliminated a major concern of guides. They had to take their hands off the oars from time to time, either to cast a line or take a shot. Thole pins wouldn’t do for that, the oars would be overboard in a flash if you took your hands off them when hole pins were in play. 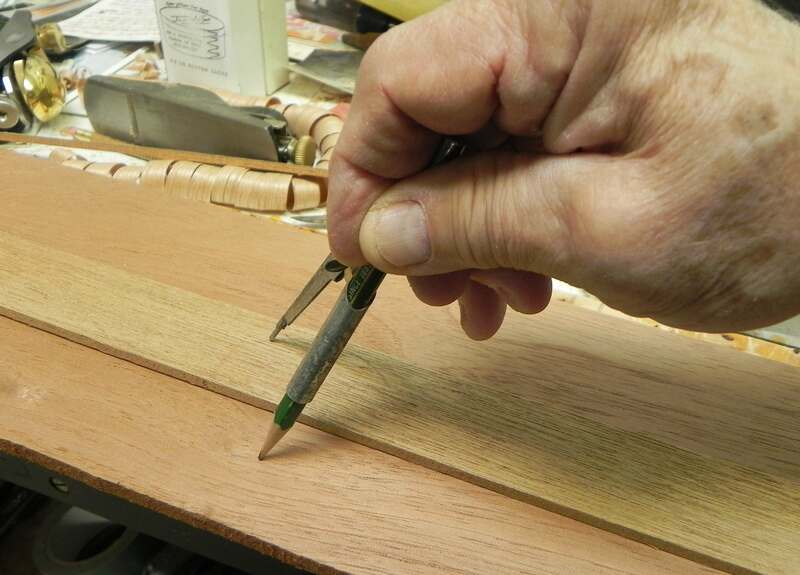 To get that advantage by using pinned oars you gave up feathering. During days when the wind kicks up with gusts to 20 to 30 miles per hour it is next to impossible to row upwind with pinned oars. It becomes a real struggle to make any progress at all. A secondary advantage of pinned oars is that they maintain the proper distance from the oarlock to the grip. Because guideboats have such a narrow beam the oars must overlap in order to get enough leverage. Pinned oars automatically set this distance. 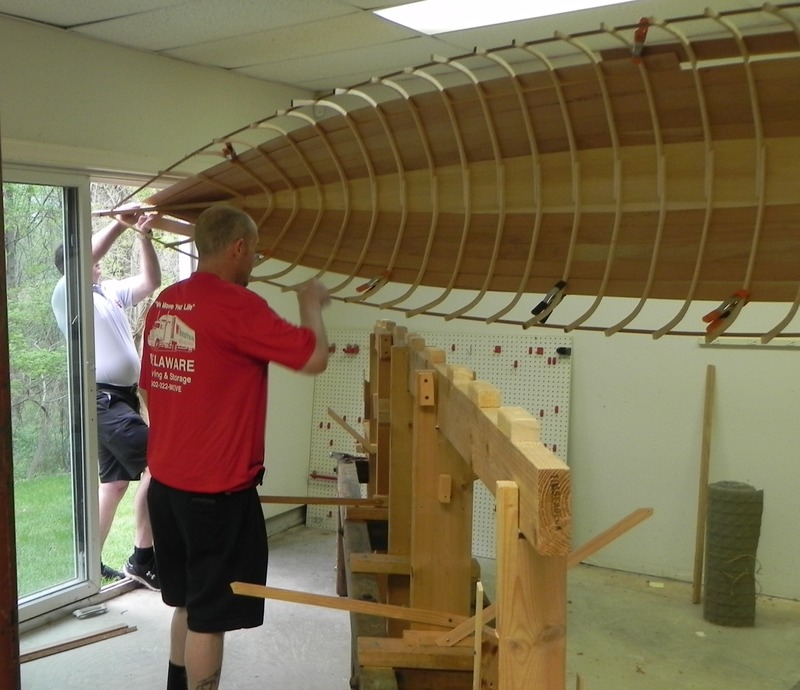 Another disadvantage of pinned oars is that they do not cushion any collision with something like a dock or bank. If you try to fend off either one using these oars you will likely capsize or damage your boat. 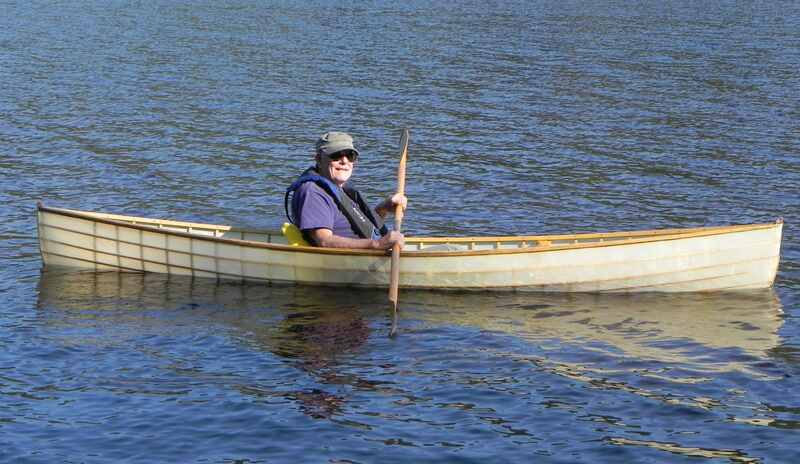 John found that out in the Ninety Miler race when his oar go stuck in a bank. 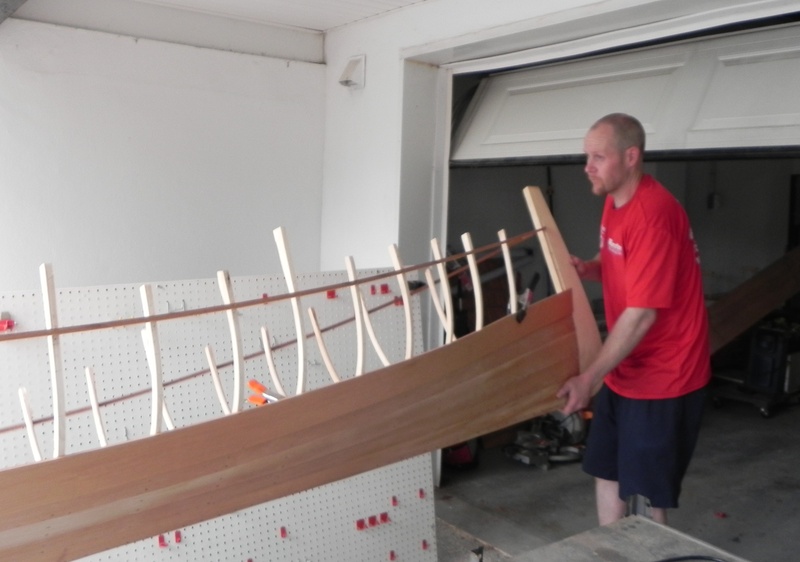 The momentum of his boat moving forward split the gunwale and necessitated emergency repairs. John’s guideboat damaged in the Ninety Miler race when his oar lodged in a bank causing the gunwale to split. Quick repairs were made with a C clamp to allow him to continue the race. There is an alternative arrangement, called “buttons and leathers”, that solves just about all these drawbacks. In this case the pin is joined to a ring that can slide up and down the loom of the oar. The ring is prevented from sliding off the end of the oar by a “button”, or ring made of leather. The oar is protected from wear from the ring by a leather sheath called the “leather”. Buttons and leathers allow you to feather your oars and the oars won’t go overboard if you let go of them. However, they do not set the proper distance between the oarlock and the oar grip. But I have used buttons and leathers ever since I built my first guideboat and setting the proper distance has not been a problem. It becomes an automatic sort of thing. I don’t know why guides did not switch to the buttons and leathers arrangement. It is probably the same reason that every guideboat builder (and there were over 70 at one time) kept scrupulously to the same basic guideboat design. They were so precise in copying the basic design that even experts find it difficult to identify who the builder of a certain hull was. 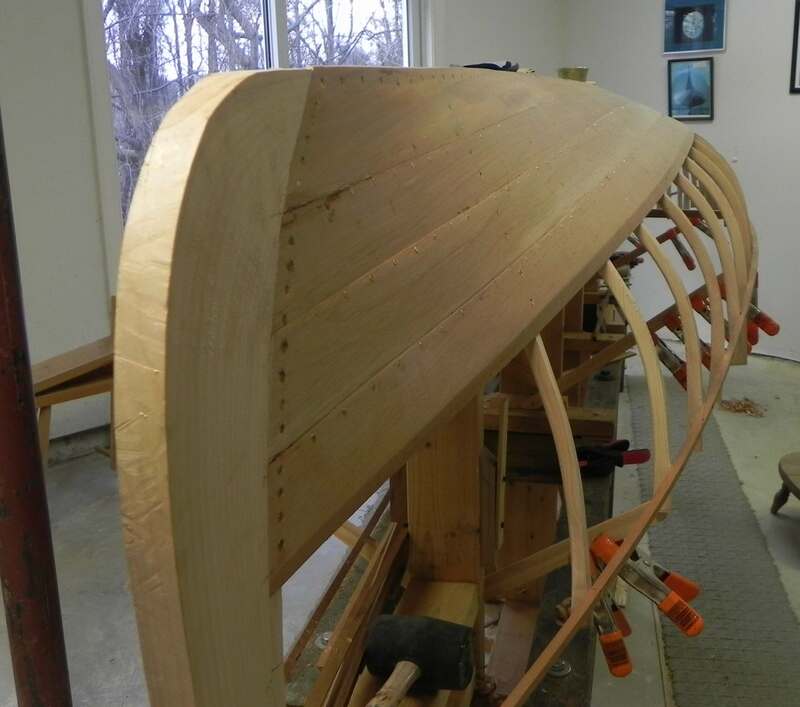 These thoughts on guideboat oars came about because I just finished a set of oars for the latest boat I am building. They are made of figured cherry and are a beautiful example of it. Some have called it “quilted” cherry while others “flame” cherry. Here it is. Oar blades of quilted cherry. Upper end of oars made of quilted cherry. 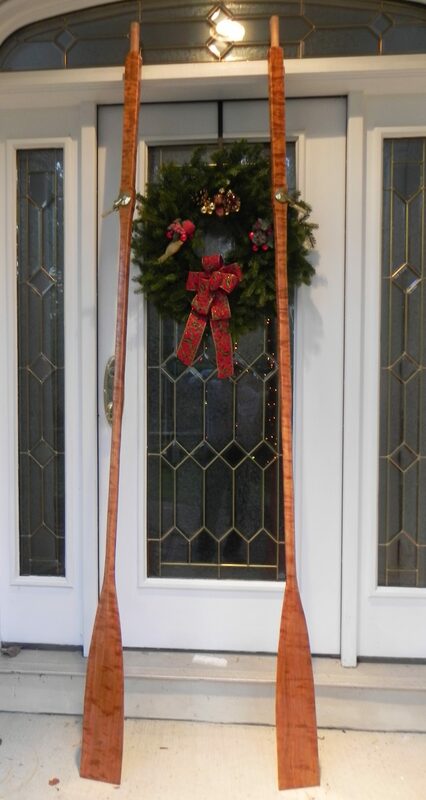 Long view of guideboat oars made of quilted cherry. Finally, I wish you all the joy of the Holidays and a great New Year! Thanks for following my posts.